Historically, fisheries and the conservation community have struggled to find common ground. The tension between one's desire to turn a profit and the other's to preserve endangered or protected marine species that can be killed as bycatch has made it difficult to find solutions that satisfy both. Now, a new online tool developed by researchers at San Diego State University in collaboration with the National Oceanic and Atmospheric Administration (NOAA) and other universities could win support from both groups. EcoCast, developed with funding from the NASA Applied Sciences Ecological Forecasting Program, provides computer-generated maps to help fishermen target productive fishing spots while alerting them to areas likely to harbor protected species. "This is a really different way of approaching fisheries management," said Rebecca Lewison, a lead scientist on the project from San Diego State University and senior author of the new paper. "EcoCast pioneers a way of evaluating both conservation objectives and economic profitability. Instead of trying to shut down U.S. fisheries, EcoCast is trying to help U.S. fishermen fish smarter, allowing them to meet their set quota of target catch and avoid unwanted bycatch." Current protection zones for species are static, meaning authorities declare a zone off-limits to fishermen for some duration of time. But weather and oceanic conditions are ever-shifting, with species constantly moving in and out of protected areas. When protection zones are out of sync with the animals they're designed to protect, both fisheries and conservation lose. What's needed is a more dynamic tool that shifts protected areas in response to species' movements, Lewison said. Enter EcoCast. The new tool works like this: Every day, EcoCast pulls in data from the NOAA CoastWatch program, which uses satellite imaging to monitor ocean conditions around the world. Then it combines that with existing data on where both target fish populations and endangered species are likely to be found under various ocean conditions. The result is a probability model that can predict where different marine species are likely to be found that day. Each morning, fishermen can receive an up-to-date report based on the day's ocean conditions letting them know where the fish they want are–and where endangered species are likely to be, too. In doing so, EcoCast aims to improve the economic and environmental sustainability of fisheries that have inadvertently caught and killed sensitive species. "We're harnessing the field of big data so that information on ocean conditions can be of use to fishermen are likely to find the swordfish they want to catch while also avoiding the species that they do not want to catch," said Elliott Hazen, a research ecologist at NOAA Fisheries' Southwest Fisheries Science Center and lead author of the new paper. 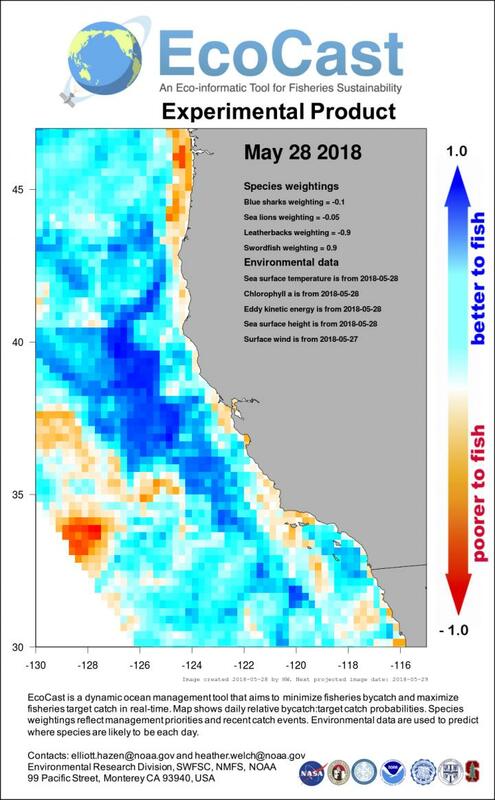 Right now, EcoCast provides bycatch warning locations for leatherback sea turtles, blue sharks and California sea lions, Lewison explained, and is currently focused on a region off the coast of California. But she hopes the team behind the program can expand the number of species and even to other fisheries in the near future. "This program can be modified to meet the future needs of fishermen and the conservation community," she said. "It can take into account new types of fishing gear, new regulations and new fishing areas that might open up." In addition to Lewison, the team includes scientists and managers from NOAA; NOAA CoastWatch West Coast Regional Node, the University of California, Santa Cruz; Stanford University; Old Dominion University; University of Maryland; and the University of the Sunshine Coast in Australia. A number of fishermen also contributed to the design of and data collection behind the program. When the researchers modeled how use of the EcoCast might play out under real fishing conditions, they found they could adequately protect endangered species while making off-limits areas between two and 10 times smaller, providing fishermen dramatically more space to fish for target species. These findings were published this week in the journal Science Advances. "EcoCast is an example of Fisheries scientists working with our academic colleagues to promote sustainable commercial fishing opportunities through efficient catch and bycatch avoidance, maximizing fishing opportunities while ensuring the sustainability of fisheries and fishing communities, " said Toby Garfield, director of the Environmental Research Division at NOAA's Southwest Fisheries Science Center. This means that fishermen are likely to embrace and use EcoCast for a couple of reasons. For one, their own fish hauls and profits benefit from the reduced size of areas closed to fishing. But just as importantly, EcoCast demonstrates the importance of industry-science partnerships. The EcoCast team worked with fishermen from the beginning to help design and develop the program, acknowledging the critical role that fishermen play in the future of sustainable fisheries. "EcoCast represents a new approach to dynamically manage our ocean resources, which is an exciting advance in fisheries management, "Lewison said "By working directly with fisheries, we can develop tools that can help US fleets to fish smarter."